As a pregnancy progresses, the need for choline subsequently increases. Researchers from the Nutrition and Metabolism Research Program in British Columbia recently published a study on the effect of low vitamin B12 levels on choline levels and infant growth. The study was published in the American Journal of Clinical Nutrition. Three groups of women were analyzed for the study – 264 pregnant women in the 16th week of gestation, 220 pregnant women in the 36th week of gestation and 88 women who were not pregnant (control). Vitamin B12 deficiency was found in all three groups, but as the pregnancy progressed, so did the prevalence of vitamin B12 deficiency with deficiency being noted in 10% of women in the 16th week and 23% of women in the 36th week. Marginal deficiency prevalence was even greater with 21% and 35% of women in the 16th and 36th weeks of gestation being affected, respectively. Results: Low vitamin B12 levels resulted in low free choline levels, which ultimately affected growth rate in infant males. According to researchers, vitamin B12 deficiency may be associated with impaired infant growth independent of undernutrition. Source: Wu BT, Innis SM, Mulder KA, Dyer RA, King DJ. 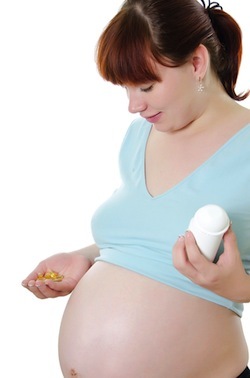 Low plasma vitamin B-12 is associated with a lower pregnancy-associated rise in plasma free choline in Canadian pregnant women and lower postnatal growth rates in their male infants. Am J Clin Nutr. 2013 Sep 4.